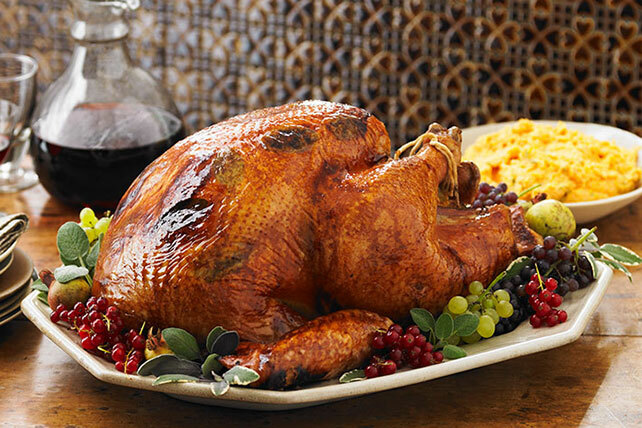 Use our Brined Turkey Recipe to make a delicious Thanksgiving turkey! Once you try this Brined Turkey Recipe, you may never go back to unbrined again. Try our Brined Turkey Recipe today. Cook 1 qt. (4 cups) water, sugar, salt, vinegar and pepper in saucepan on medium heat 10 min. or until sugar and salt are dissolved, stirring occasionally. Pour into plastic container large enough to hold brining liquid and turkey. Add remaining water. Cool completely. Remove and discard neck and giblets from turkey cavities. Rinse turkey; drain well. Add turkey to brining liquid; cover. Refrigerate at least 10 hours or up to 24 hours. Remove turkey from liquid; rinse well with cold water. Pat dry with paper towels. Cook as desired. Use either kosher salt or table salt without iodine when preparing the brining liquid. When choosing the container used to brine the turkey, be sure to select one that will fit in your refrigerator. The turkey needs to be completely submerged in the brining liquid. If turkey is not covered, prepare enough additional brining liquid to completely cover turkey. Another brining method is to brine the turkey in an oven-roasting bag or large brining bag. Place turkey and brining liquid in bag; close bag tightly. Place in 16-qt. stockpot or container. Brine in refrigerator, occasionally turning bag to ensure even brining. Turkey neck and giblets can be used to make soup stock or gravy. If unable to use within a few days, freeze until ready to use. Place frozen turkey, breast-side up, in its unopened wrapper on tray in refrigerator. Allow 5 hours per pound to completely thaw the turkey. Never thaw frozen meat on the countertop at room temperature.